Didn't even realize, but this weekend is Mega Man's birthday. Wow, um, Happy Birthday, dude! The franchise's first release was on Dec. 17th, 1987, making everyone's favorite blue robot 27 years old! To celebrate 27 years of robot blasting, Capcom is throwing a sale on the Wii U and Nintendo 3DS eShop this weekend, lasting until Dec. 22nd. 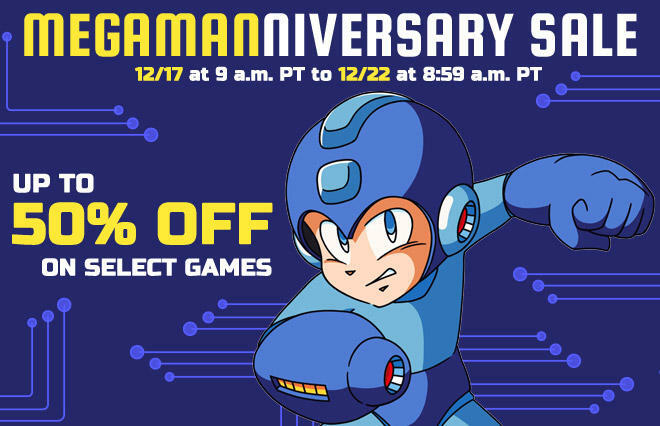 Six Mega Man games are available for a slashed price of up to 50 percent off. On the Wii U Virtual Console, we have the NES games Mega Man 5 and Mega Man 6 available for $2.49 each, and the Super Nintendo's Mega Man 7 has also been dropped to $3.99. Easily, the best of this bunch is Mega Man 7. It's a really awkward game with Mega Man's sprite simply being too big to recreate the genuine feel of the older games, and yet he is still really stiff in the face of the superior Mega Man X games. That being said though, Capcom obviously had a lot of fun using the Super Nintendo's powers in making this the most expressive game in the classic series. So much soul is poured into Mega Man, his world, and his allies' and enemies' design. That and a light RPG system make it a unique and worthy addition to any fan's collection. As for the Nintendo 3DS, the offbeat Game Boy games Mega Man II, Mega Man III and Mega Man IV are all available for $1.49 each. Some fans will swear by Mega Man IV, but I've never really been able to into Mega Man's portable outings. The one fans regard as the best, Mega Man V, is not on sale. Capcom hasn't had the best reputation for making new Mega Man games since then. Cancellations have hit fans hard, and frustration runs rampant with everybody seeming like their hands are tied. As one of these passionate followers since day 1, I sometimes get a little too hard on the company lately, but deep down inside, I know that Capcom is in a tough situation with most of its classic game designers creators, including Mega Man co-creator Keiji Inafune, hitting the road to follow other life ambitions. It might not always seem like it, but Capcom has indeed heard the cries and pleas of the Blue Bomber's massive fanbase over the years. I kick and scream like a spoiled child sometimes in regards to Mega Man Legends' voice acting issues preventing a digital re-release, but the company has done a pretty good job making most of Mega Man's best and brightest classic titles available through the Nintendo eShop and PlayStation Network. Between an appearance in Super Smash Bros. and frequent sales making his best games cheaply available for a new generations, it seems like this is the best we can do for Mega Man while Capcom continues to rediscover itself. I'm fine with that even if I can't get my hands on a reasonably priced copy of The Misadventures of Tron Bonne.